Adding a wall to a room can be a challenge in the best of circumstances. But project gets even more complicated when the room has a drop ceiling. Some do-it-yourselfers might be tempted to simply build the new wall up to the drop ceiling height and stop. But that would be wrong. In almost all cases, it is proper to construct the wall so it connects to the true ceiling joists above the drop ceiling line. The drop ceiling is simply a weak, decorative feature. New walls in rooms with drop ceilings must be attached to the true ceiling joists. Remove the dropped ceiling panels around the proposed new wall construction area in the room. Take out enough panels to make working around the wall project comfortable. Remove these panels carefully: Don't bend them out of shape or break off corners unnecessarily. Examine the way the dropped ceiling suspension grid is installed. 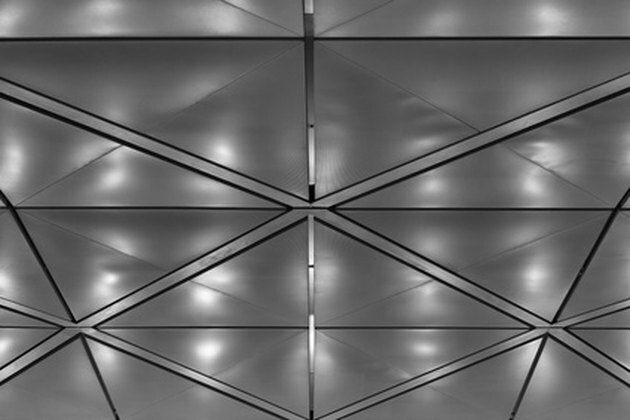 Most grids are suspended by wires extended down from the true ceiling. By untwisting these wires, you can remove them from the grid bars. You can also remove the wires from their mounts in the true ceiling. Either way, determine how you can reposition the suspension wires so the grid stays stable when you remove the wires over the area where the new wall will be built. Reposition these wires to achieve stable support for the grid before you remove wires from the "work zone." You don't want the grid to sag or fall down. Remove enough of the suspension wires over the work zone so you can work comfortably. Dismantle the metal suspension grid as necessary to remove it from the immediate work zone. Use tin snips to carefully cut the grid away if necessary. Avoid using a power tool like a reciprocal saw: The vibrations will be intense and could disturb the rest of the grid. Avoid twisting or using excessive force to free pieces of the grid. You'll want to preserve their condition as much as possible and reuse them again. Construct the new wall in the customary fashion. Connect the wall studs to the true ceiling joists in a proper manner. You may have to improvise construction methods to work around the existing suspension grid system. Building narrower stud sections is one work-around possibility. The studs should be rock solid and the wall frame should not wobble or shift. You can only achieve this soundness by connecting to the ceiling joists. Finish the wall with insulation and drywall. Install insulation and drywall all the way up the wall to the true ceiling. You don't have to tape, mud or paint this unseen portion of the wall, but you should at least roughly finish it. Tape, mud, sand, prime and paint the new wall before finishing the ceiling around the wall again. Reinstall the grid system around the new wall. Cut the old ceiling tiles to fit the new configuration. You may have to improvise ways to connect and anchor the grids around the wall, but complete this task carefully so it is not unattractive or noticeable. You'll be living with this new wall for a long time, so make it look neat and proper now.